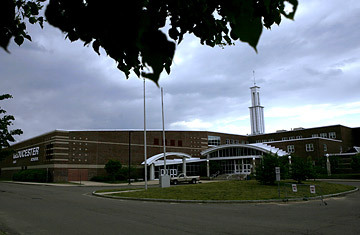 Gloucester High School in Gloucester, Mass. After a controversy erupted in late May over a proposal to distribute contraceptives at Gloucester High School, principal Dr. Joseph Sullivan said he was surprised that no reporter had approached him for his take on the matter. If they had, Sullivan told TIME on June 11, he would have explained straightaway that "a lack of birth control played no part" in a quadrupling of the number of teen pregnancies at the school this year compared with last year. "That bump was because of seven or eight sophomore girls," Sullivan told TIME. "They made a pact to get pregnant and raise their babies together." Since TIME first wrote last week of this "pact," as Sullivan called it, a media firestorm has hit this seaside town on Massachusetts' north shore. News outlets from as far away as Australia and Brazil have been quick to hone in on the more salacious details surrounding these young mothers-to-be. But at a press conference today, Gloucester mayor Carolyn Kirk emerged from a closed-door meeting with city, school and health officials to say that there had been no independent confirmation of any teen-pregnancy pact. She also said that the principal, who was not present at the meeting, is now "foggy in his memory" of how he heard about the pact. Sullivan has not spoken publicly about the teen pregnancies since he told TIME earlier this month that several girls repeatedly requested pregnancy tests at the school clinic and that some had reacted to positive test results with high fives and plans for baby showers. Pathways for Children CEO Sue Todd, whose organization runs the school's on-site daycare center, told TIME on June 13 that its social worker had heard of the girls' plan to get pregnant as early as last fall. She noted that some of the girls involved had been identified as being at risk of becoming a teen mother as early as sixth grade, when they began to request pregnancy tests in middle school. "What we've seen is the girls fit a certain profile," Todd said. "They're socially isolated, and they don't have the support of their families." On June 11, the mayor and the school's superintendent, Christopher Farmer, said that some of the sophomores at Gloucester High appeared to be getting pregnant on purpose. Farmer said today he now believes that some of the girls who were already pregnant decided to band together to stay in school and raise their babies together. He added that if he had previously known of the pact as described by Sullivan, there would have been a schoolwide intervention earlier. None of the rising juniors TIME identified as being members of the pact have come forward publicly, but nine Gloucester High students have talked to TIME about the girls who decided to get pregnant. Some described the pregnant teens as having little parental supervision. "They could stay out all night if they wanted," says a classmate, whose parents requested that she not be identified by name. Others noted a herd mentality. "I think the plan was a lot about peer pressure," says Nicole Jewell, a rising junior who describes herself as being friends with some of the girls involved. "But a lot of girls were excited to be a part of it." So did the girls make a formal pact to get pregnant together or not? Without comment from any of the pregnant students themselves, it may be impossible to determine exactly what they agreed to, and when. So far, the only school official to use the word pact is Sullivan, who reportedly now says he does not recall who told him about the pact in the first place. But what does seem clear based on TIME's reporting is that some of the girls in question did at least discuss the idea of getting pregnant at the same time, and that too little was done to educate the girls on the potential ramifications of that choice.